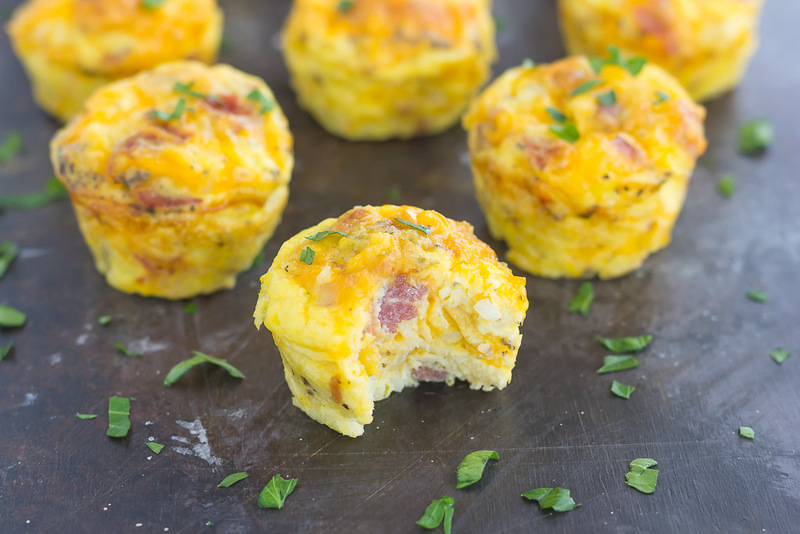 Filled with eggs, cheddar cheese, bacon, and hash browns, these Cheesy Egg and Hash Brown Cups are pop-able, and delicious for a quick breakfast on-the-go! I think I may have found my new favorite breakfast. And that’s a big deal for me! You see, I’m not really much of a breakfast person. Sure, I’ll make a baked good and will have those for breakfast during the week, but the following week, I always return to the same routine. And that consists of grabbing a bagel, yogurt, or granola bar as I head out the door for work. Those foods are delicious, but sometimes I want something a little more “breakfast-y”…know what I mean? Eggs, bacon, the works. Something that fills me up and is easy to grab ‘n go. Well, friends, I made the perfect breakfast that meets my standards. 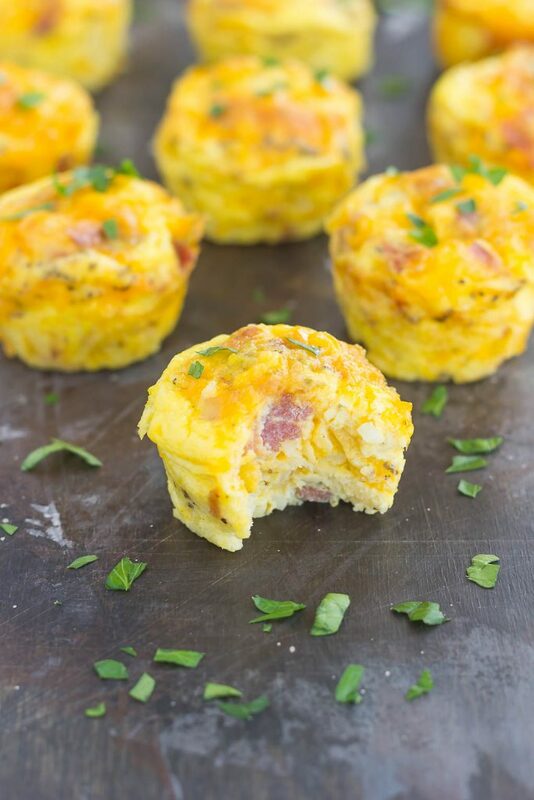 Filled with eggs, cheddar cheese, crumbled bacon, and hash browns, these Cheesy Egg and Hash Brown Cups are perfectly portable, pop-able, and delicious for a quick breakfast on-the-go! 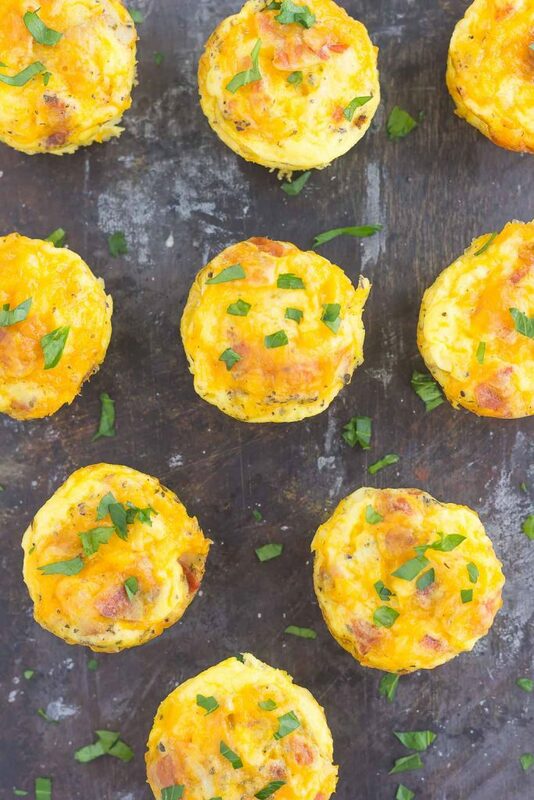 These Cheesy Egg and Hash Brown Cups have everything you would want in a hearty breakfast, but are combined in mini muffin form. Easy to customize based on your preferences and a breeze to whip up, you will love the taste of these cuties! Since I had bacon and hash browns on hand, I decided to toss those, along with some eggs, cheddar cheese, and spices, into a bowl. Simply mix together, pour into a muffin tin, and bake. That’s it! In about 15 minutes, you will have a hot and delicious breakfast. 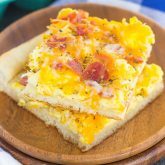 Kid-friendly and filled with a classic breakfast flavor, you can make these Cheesy Egg and Hash Brown Cups ahead of time and just grab ‘n go for a convenient breakfast. These little guys also freeze well, so you can enjoy this breakfast for months to come! 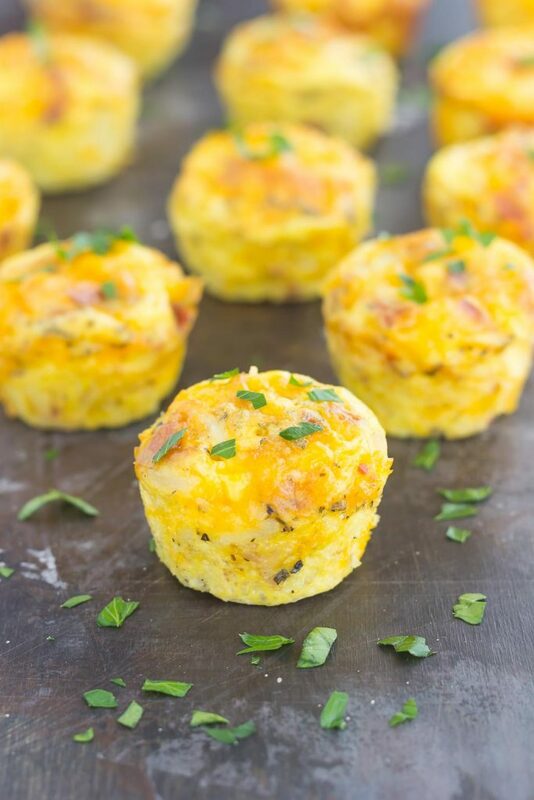 Filled with eggs, cheddar cheese, crumbled bacon, and hash browns, these Cheesy Egg and Hash Brown Cups are perfectly portable, pop-able, and delicious for a quick breakfast on-the-go! Preheat oven to 375F. Lightly grease a 24 cup mini muffin pan with non-stick cooking spray. Set aside. Add garlic powder, Italian seasoning, salt and pepper, bacon, hash browns, and cheese. Stir thoroughly to combine. Pour mixture into mini muffin tin. Bake for about 15-17 minutes, or until middles are set. Remove from oven and let cool for 5 minutes, then remove from muffin tins. Breakfast cups will last for about 3 days, refrigerated, or up two 3 months if frozen. I struggle with breakfast, too. My ideal breakfast is a giant chocolate chip cookie, but that's not supposed to be a good idea. This looks so delicious! I love adding the hash browns! And that cheesy top. Mmm. Ha ha I would love a chocolate chip cookie or some brownies for breakfast, too. But for now, these eggs cups will just have to do! :) The hash browns were perfect for these little guys, definitely made them more filling! Thanks so much for the kind words and pin, Chelsea! These are definitely a great before school breakfast or to grab 'n go out the door! Gayle, these are so cute! and I LOVE how quick to make, and easy to grab and go they are ;-) Pinned. de-licious! I love how easy these are to make, too! And so versatile depending on your tastes. Thanks so much for the compliments and pin, Michele! What a delightful surprise these would be on the breakfast table! Kids would gobble them up quick! I agree, Melanie! I think kids would love popping these into their mouths! Cute and delicious! This will be a breakfast treat for all of us Gayle!! Looks super duper delicious and filling! These cups turned out so good...all of my favorite breakfast ingredients combined into one! Thanks for the breakfast love, Ami! Gayle, these look so easy! And grab and go. Right? I mean, I might even plug these into the kids in their carseats, how messy can they be? And they're healthy too, I really like to give kids eggs for breakfast, they're the "perfect" food. Plus, bacon is a must-have at breakfast time. yum. Pinned!! These look so yummy! A perfect little breakfast bite. Ugh, I really miss eggs! Aww that's too bad that you can't have eggs, Kelly! Is there any type of egg substitute that you could use? Thanks so much for the kind words! This is a great idea! Better than just having plain ol'hash browns and with cheese!!! YEAH! lolz! Love it Gayle! Thanks for the muffin love, Karen! These little cuties definitely jazz up a regular breakfast. And they're fun to make, too! Whenever I think of a "real" breakfast, eggs always come to mind! I usually don't have much time in the morning to cook them up, though, so I don't make them nearly as often as I'd like. These are perfect because I can just make a biiiig batch on the weekend and be set for the entire week! WOO! Great recipe! I always think of eggs, too! Whenever I go out to eat, I usually get something involving eggs. And these are so perfect for busy mornings! Thanks for the compliments, Denise! These little cups sound like they would be perfect for when yo go back to work. And no, I definitely can't resist hash browns! They made this dish extra tasty! YUM!! These look amazing!! I love eggs for brekkie!! They are just so filling and satisfying! Def a great way to start the day! !...or finish it!! Who doesn't love a good breakfast for dinner every once in a while?! This is a great idea and a good twist on the scramble eggs. It gets old. I always have to have breakfast, but I don't really feel like making it every day. This is fantastic. Thanks for sharing! I agree, Eva! Plain 'ole eggs to get boring after a while. And this is such a fun twist on all of the breakfast staples. Thanks so much for stopping by! These look amazing! Perfect for breakfast on the go and for the kiddos before school! Thanks, Julie! This is such a great breakfast to grab and then go! I also froze a few of these so that I can defrost them quickly in the upcoming months! Gayle, these look so awesome! And I love that they are small but filling--a great thing to grab when I'm heading out the door for breakfast on the go! I love their bite-sized form, but yes, definitely a filling breakfast! Thanks so much for the kind words, Amy! This is one of my favourite breakfasts too. We love them in our house :) I like anything that is in little bite sized portions. Don't these little cuties make the best breakfast, Dannii? I'm so glad you like them, too! These are adorable little breakfast bites. Gayle :) Perfect for on the go or even packing them up into school lunches! These would be wonderful packed in a lunch! Great idea, Kelly! Thanks so much for the breakfast love! I love how you described hash browns, Mary Frances! And I always load mine with salt and pepper, too! :) These are definitely perfect for the upcoming season! Thanks, Medha! I like freezing them, too. I have a small batch in my freezer right now for the upcoming months! These are perfect for breakfast! I always love mini food! Thanks, Ashley! I love mini foods, too. These are adorable! I'm not much of a breakfast person either, so these would be perfect! Thanks, Liz! Sounds like these cups would be right up your alley! So easy to make and tastes even better! What a great idea! Such a good grab and go option for busy weekdays! Thanks, Annie! These are so perfect for busy weekday mornings! Yum! What delicious looking little breakfast cups! I usually go for more sweet breakfast items ... like oatmeal or granola, etc. but I do love having eggs to switch it up! Such a nice change! I'm the same way, Ashley! I love switching up my breakfasts, too, otherwise it gets pretty boring. Thanks for the compliments! Its fabulous that these freeze well. I've been trying to cook things that freeze well for an easy breakfast and/or dinner options. 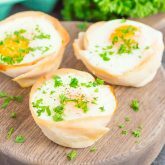 Perfect breakfast hash cups, my husband and daughter will LOVE these. I love freezing breakfast items, Kathy! It's so easy to just take them out and microwave for a quick and easy breakfast. I hope you daughter and husband find these cups delicious! I could so eat many, many of these. I LOVE that they're grab and go!! Thanks, Sue! That's my favorite part, too! Those sound awesome. Great idea! I'm always running around like a maniac in the morning. These would be a great breakfast for us. I know what you mean, Michele! If I don't have something quick to grab before work, then I don't eat breakfast. So these little guys are perfect for me! Thanks, Ceara! I love how versatile they are, too. And I love your suggest of red peppers! I will definitely have to try that next time! I make a version of this recipe, never thought adding garlic and Italian seasoning. I love using different seasonings when baking, so I thought this was perfect! And I'm a huge garlic fan, so I practically use garlic powder (or cloves) in everything. Thanks for stopping by, Heather! These are a great idea and definitely fit the "breakfast-y" bill! I love breakfast and delicious, poppable cups like these are why! Yummy! Thanks, Lindsey! These little cuties definitely pack a hearty punch in mini form! Yum! Love love love breakfasts like this where you can make them before and grab & go! Grab 'n go breakfasts are the best, Leah! The hash browns go so well with these egg cups, Ashley! Thanks so much for the pin and for stopping by! I love breakfast. I don't struggle with breakfast. I like it anytime. And I LOVE this recipe!!! Thanks so much, Carol! I love breakfast too, but getting me to eat it during the week is tough because I'm always running out the door. But with these little cuties, there is no excuse not to have breakfast! 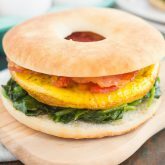 This looks like an amazing breakfast! I have got to try this out! You will love these breakfast cups! So full of flavor and easy to put together! These look so delicious! I love that you can make these ahead of time and have a great quick breakfast. Thanks, Cindy! This is definitely the perfect breakfast for those on-the-go. Hi Gayle, love that you can make these ahead of time. Usually it's yogurt and fruit for breakfast, but once or twice a week I like to have something different, like this!! Thanks for the kind words, Cher! These breakfast cups are nice to throw into your weekly breakfast routine. Not to mention that they taste amazing, too! I've made egg cups before, but I haven't added hashbrowns to them. Sounds fabulous! Thanks, Christin! The hash browns were my favorite part! It's so hard for me to eat breakfast on weekday mornings since I'm always running out the door. But these egg cups are perfect to just grab 'n go! I hope you and your husband like the addition of hash browns if you try it! Easy & Simply! Love the recipe! This is definitely a breeze to whip up and so delicious for breakfast! Thanks so much for stopping by, Ambar! Thanks for the sweet comment, Kate! How long should I cook these in regular size muffin pans? Hi Dianne! I've never made them in regular tins before, so I can't say for sure, but I would increase the cooking time by 2-3 minutes and then go from there. Hope you love these if you try them!